Actually, I don’t teach tricks, I call what I teach you to teach your puppy or dog useful relationship behaviors. 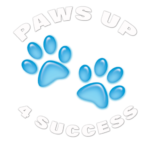 PawZup helps you and your dog companion to become co-workers and friends. Free 104 Booklet – Before you get your puppy – by Ian Dunbar, compliments of Jodee Kulp, PawZup. A must have to help you make some solid decisions before you get your new fur family member. Quick Tips to Puppy Help Now! – here are some of my best tips to help you understand and help encourage a confident well-socialized puppy. Come on over – meet – greet and HAVE SOME FUN!